Ever since it was initially introduced, the Jeep Grand Cherokee has been reinventing what it means to be an SUV. Every model year this vehicle has been upgraded, restyled, and perfected. That is why it should be no surprised that the 2019 Grand Cherokee is a testament to all of the Grand Cherokees that have come before it, and the creators at Jeep. 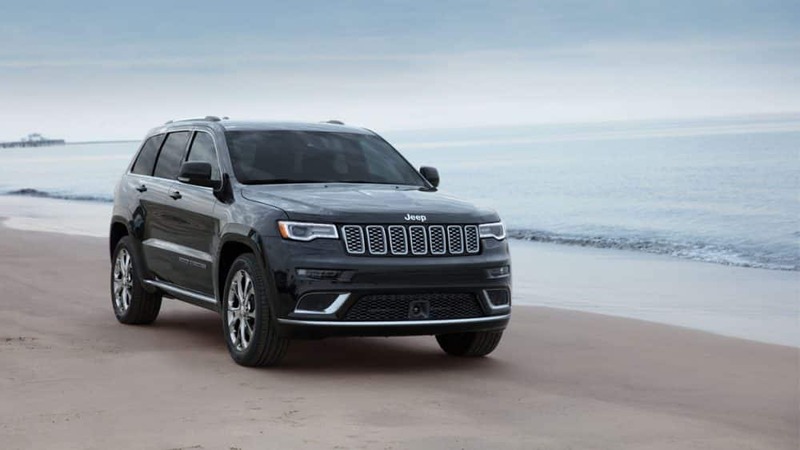 Along with the impressive engine options, the plush interior, and the off-roading capabilities, the Grand Cherokee truly stands out with its trim level options. There are seven trims to choose from with this SUV, and each of them is just as unique as the last. Whether you're looking for an off-roader or something that is perfect for the family, there is a Jeep Grand Cherokee for that! Keep reading to learn more about the trim options. The first trim you'll find in the Grand Cherokee lineup is the Laredo. This model comes with features like rear parking sensors, a 6-speaker sound system, 17-inch wheels, Apple CarPlay, dual-zone automatic climate control, Android Auto, keyless entry and ignition, and a seven-inch touchscreen. You'll also find a 3.6-liter V6 engine with an eight-speed automatic transmission. Moving up through the lineup you'll find the Limited, which builds on the Laredos features. You'll find power-adjustable front seats, 18-inch wheels, a 115-volt power outlet, driver-seat memory settings, a heated steering wheel, auto-dimming rearview and driver-side mirrors, leather upholstery, a power liftgate, heated front and rear seats, and remote start. You can also opt for a 3.0-liter turbodiesel engine or a 5.7-liter V8 engine. For something with a bit of an off-roading edge, consider the Trailhawk trim. This trim, on top of the Limiteds features, will get you a terrain-selectable traction control system, 18-inch wheels, 4WD with low-range fearing, off-road tires, and an electronic rear differential. Further features include underbody skid plates, an adjustable air suspension with increased suspension travel, Trailhawk-specific tuning, an upgraded instrument cluster display, hill descent and ascent control, and exclusive off-road features. The Overland model looks and feels very similar to the Trailhawk. However, this trim is designed with luxury in mind, more than off-roading. This means that you'll find less off-roading features, and more driver-aids and plush interior options. If you are looking for something that focuses directly on luxury, then you need to check out the Grand Cherokee Summit. This model throws in everything when it comes to comfort. You'll get active noise-canceling technology, polished 20-inch wheels, upgraded leather upholstery, a 19-speaker Harman Kardon system, a self-parking system, a suite of advanced safety features, and additional noise-reducing window glass. This means that your ride will be quieter, your music can be louder, and every trip will be more enjoyable. When it comes to power, there are no better SUV options quite like the last two trims offered with the Grand Cherokee. The first of these, the SRT, comes standard with a 6.4-liter engine that has the capability to produce 475 horsepower. Along with the upgraded engine, you'll get features like 20-inch wheels with performance tires, selectable performance modes, a specialized AWD system, a limited-slip rear differential, an adaptive sport-tuned suspension, a sport body kit, and sport-tuned steering and brakes. The final trim available with the Grand Cherokee is also performance based. The Trackhawk trim comes standard with a supercharged 6.2-liter V8 engine that can pump out up to 707 horsepower. It also features aggressive-looking bodywork, an upgraded adaptive suspension, lightweight 20-inch wheels, high-performance tires, upgraded Brembo brakes, and unique interior design cues. All of these trim levels give you the unique personality that you're looking for in an SUV. They offer impressive features, powerful engines, and a reliability that can't be beat. If you're interested in a 2019 Jeep Grand Cherokee of your own, check out our full inventory today! We hope to see you soon!